Unfortunately ,we have found it necessary to charge a 3% fee for the use of any credit cards and bank cards.We gladly accept checks or money orders. It is necessary that all offshore purhases be paid through Bank Wire Transfer. We ship UPS North American Van Lines worldwide. All pumps are complete with a new hose and an original nozzle. Martin and Schwartz Model 80. Circa 1948. 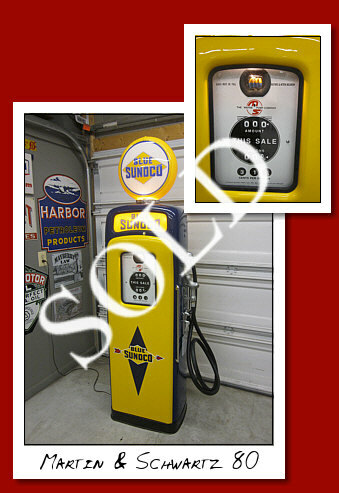 Cyclops version restored to Sunoco gasoline. 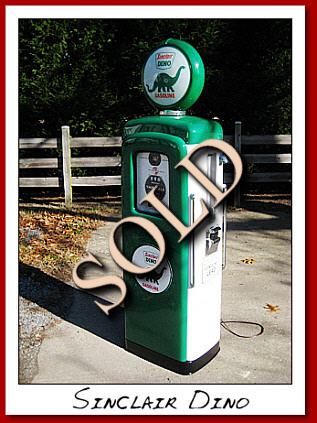 This unit was always a Sunoco gasoline pump. 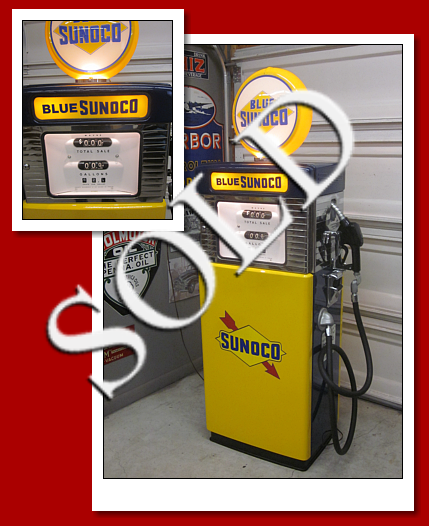 Proof is that Sunoco was the only company that ordered the pumps with blue and yellow sight glass spinners. All other companies used the red and white. Wayne Model 80. Circa 1949. "Cyclops Version"...sight glass in top. 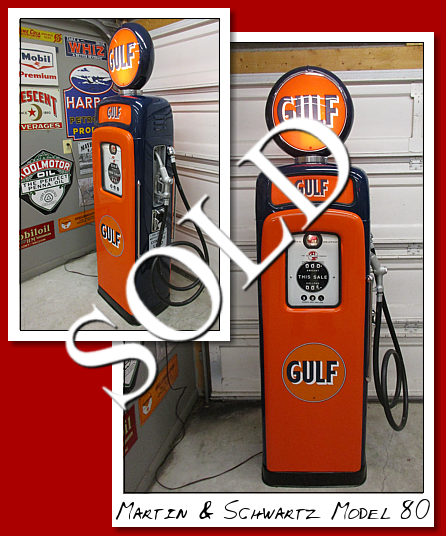 Restored to GULF gasoline. 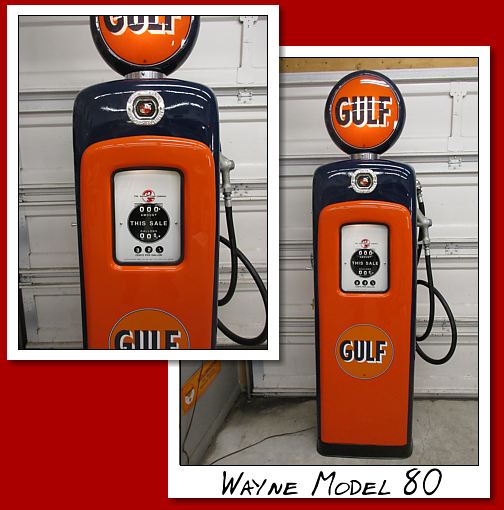 Wayne Model 80 gas pump. Circa 1950. 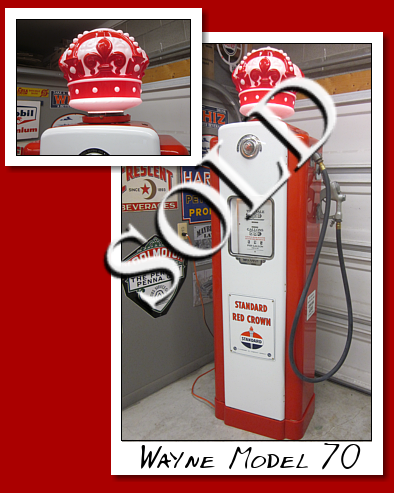 Restored to correct livery in Mohawk gasoline. 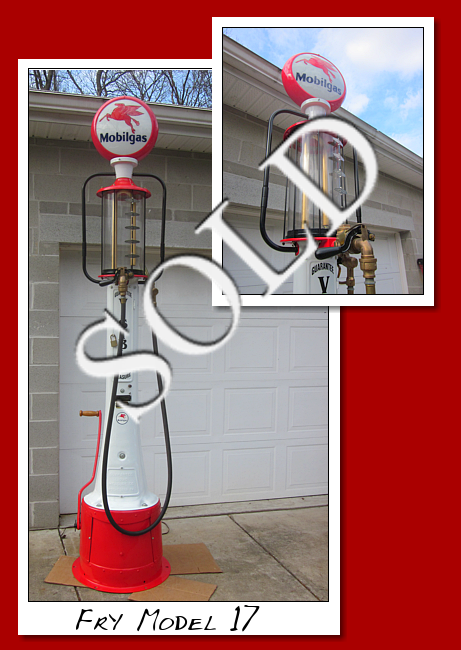 Mohawk was a company in Canada with a few stations in the U.S in the Fifties. Great color combination. Wayne Model 80. Circa 1948. Cyclops version with the sight glass in the top instead of the face. 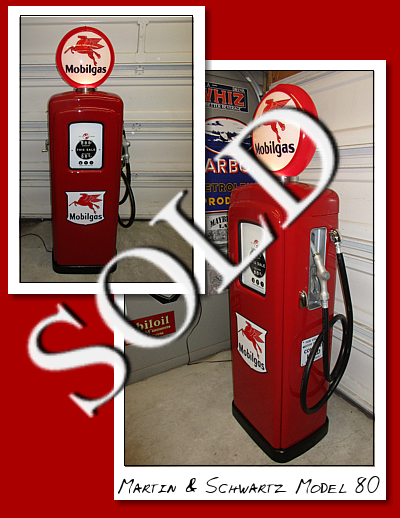 Restored to Mobilgas brand of gasoline. Has original porcelain faces and aftermarket porcelain door and contains lead signs. 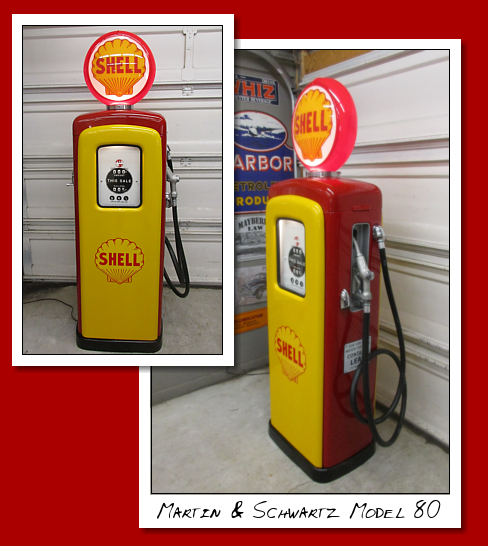 Martin and Schwartz Model 80 restored to Shell Gasoline. Circa 1948. Proper colors for that era. 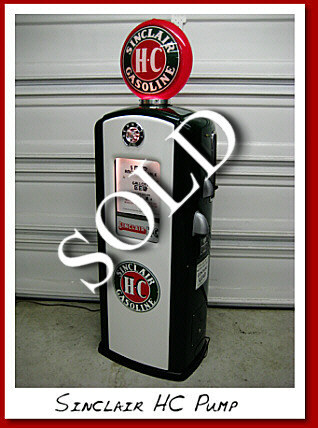 Tokheim Model 300 gas pump. Circa 1955. 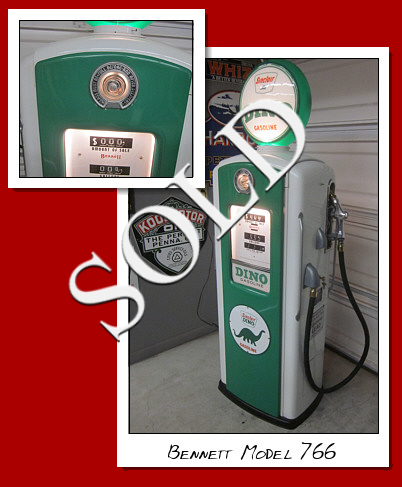 Restored to Sinclair Dino regular gasoline. 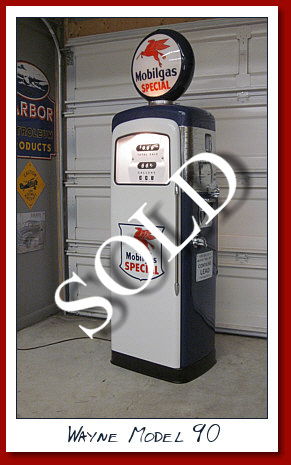 Gilbarco Model 996 "Sell-A-Vision". 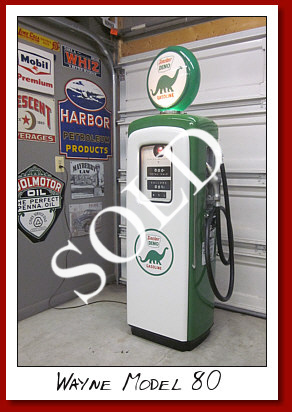 Extremely RARE....Beautifully restored to Sinclair Dino Gasoline colors. The lighted top displays a rotating message banner. This one says "Car Shop". Message top works flawlessly. 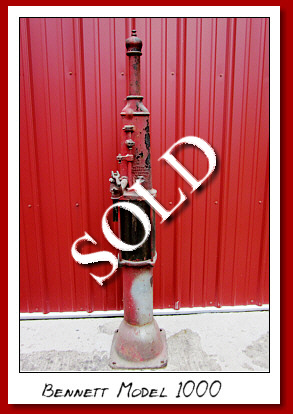 Bennett Model 788 pump. 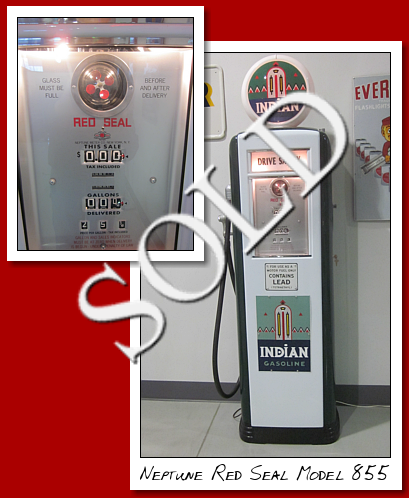 It was restored to Indian Gasoline. We converted it to a nice Oak bookshelf. 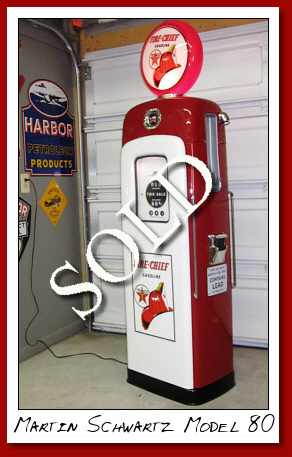 The circa on this unit is 1949. 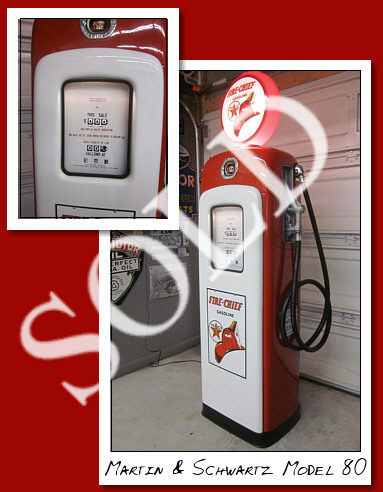 Martin and Schwartz Model 80 on high steel base gas pump. Circa 1950. Sight glass in the top, knick named "Cyclops" version. 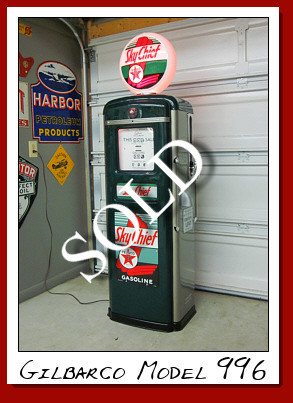 Restored to Texaco Skychief gasoline. 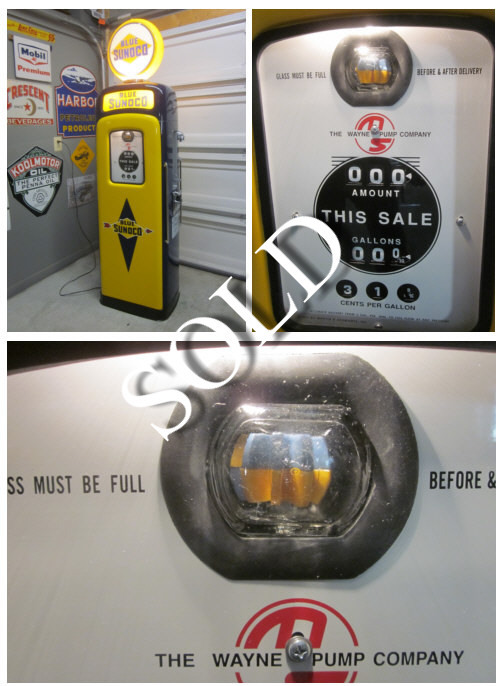 With porcelain pump signs. Very nice restoration. Martin and Schwartz Model 80 Ad Glass Top. Circa 1949. With "Eight Ball Faces." Restored to proper GULF livery. and bright metals re-chromed. 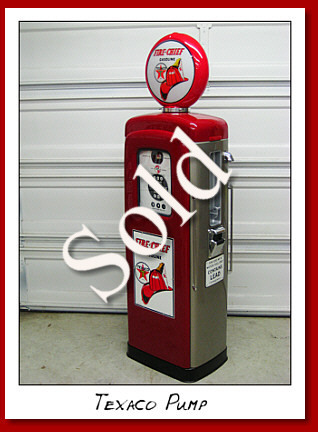 Very nice pump for that garage or Man Cave. 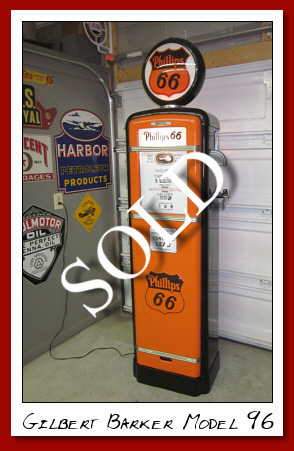 Phillips 66 to vend marine gasoline. Not your run of the mill units. Hard to find. Very collectible. 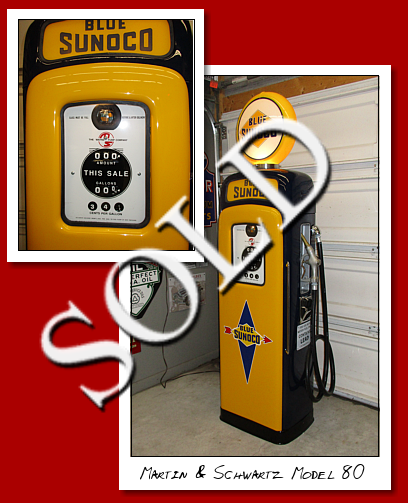 Martin and Schwartz Model 80 Restored to Sunoco gasoline. Circa 1950. 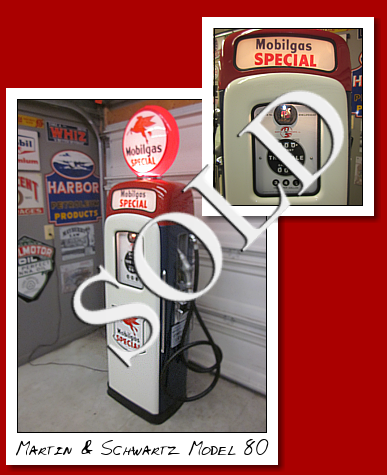 Martin and Schwartz Model 80 restored to Mobilgas gasoline. Circa 1949. Gilbert and Barker Model 66. 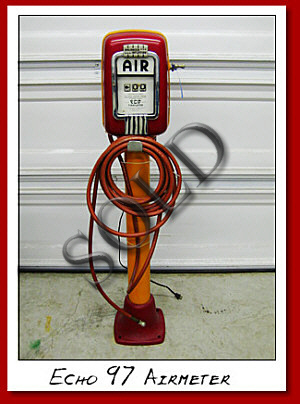 Hand operated, clockface curb pump. Circa 1923. Older restoration. Everything seems to operate on this unit. 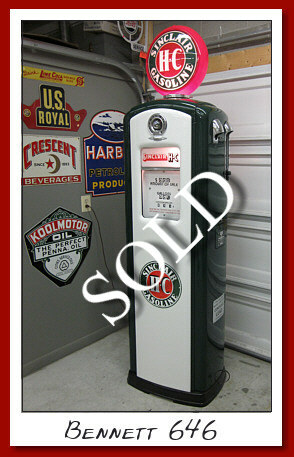 The gallon stops work as does the crank and gallon indicator. Great piece of early fuel delivery systems. Displays nicely. I have a Sinclair HC globe on it but it can be branded any brand. 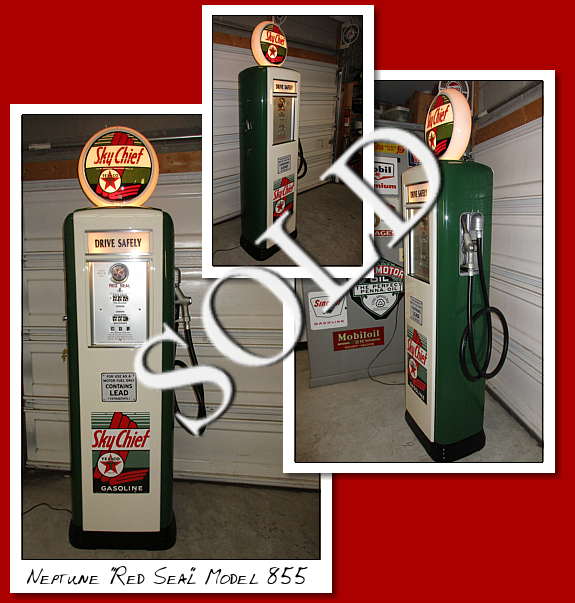 Neptune " Red Seal" Model 855 gas pump. Circa 1939. 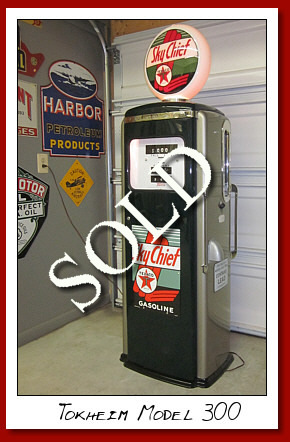 Restored to Texaco Skychief gasoline. This pump came to me out of Arizona. There was no rust of any kind throughout. It is beautiful condition and newly restored by my shop. Over 72" tall with globe. Gilbarco Model 906. Circa 1953. 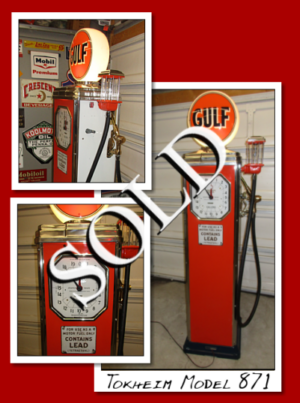 These units were used by Standard Oil for many years as ESSO pumps. 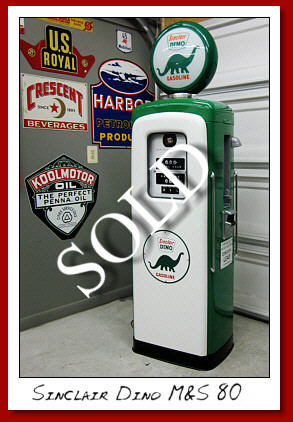 Tokheim Model 871 clockface gas pump. 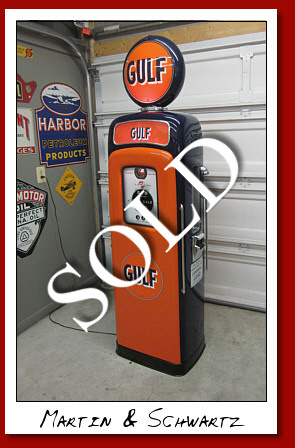 Built specifically for the Gulf Oil Company, under contract. This unit is circa 1935 which makes it 83 years old. 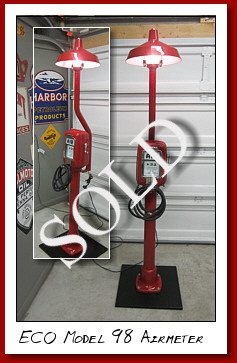 It has an older restoration which was done beautifully, but not by our shop. All the pumping hardware, motors and plumbing is still there and it too was cleaned before paint. 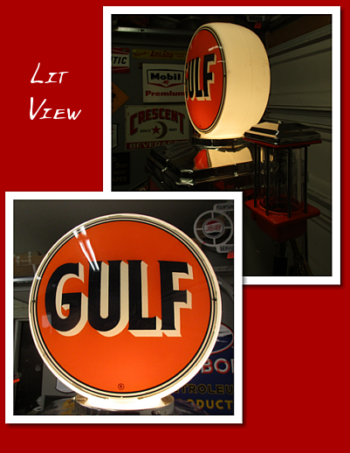 The "original GULF milkglass globe" is included which makes this unit period correct. The original porcelain faces were in tact and the reset crank works easily. Top and all bright metal is polished. Pump is lighted. The paint is in near perfect condition. One very small spot of 1/8" has a chip. Otherwise the paint is smooth and lustrous, with great color I can supply Gulf decals for the front but personally thought that less was more in this case? The pump looks complete and very classy. You won't find a nicer example. A.O.Smith Model 48. Circa 1959. 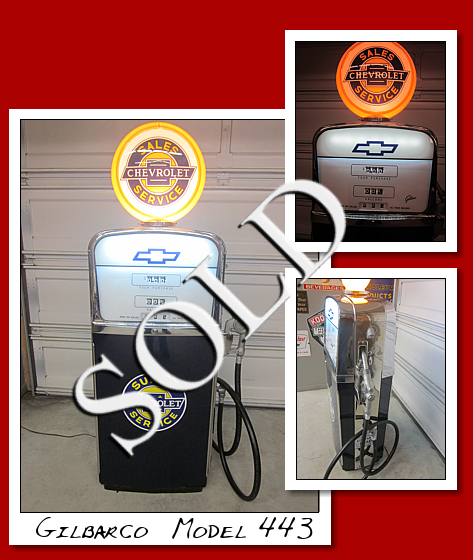 Restored to Super Chevrolet Service. All stainless steel has been polished to a mirror finish and all other bright metals were re-chromed. Absolutely stunning unit. 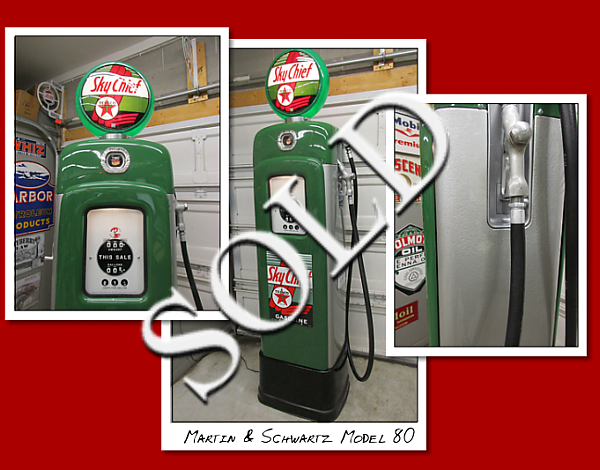 Martin and Schwartz Model 80 gas pump. Circa 1950. 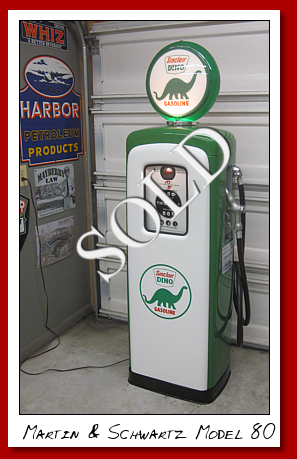 Restored to Sinclair Dino gasoline. With unique dealer I.D.Tag re-located in as found local. 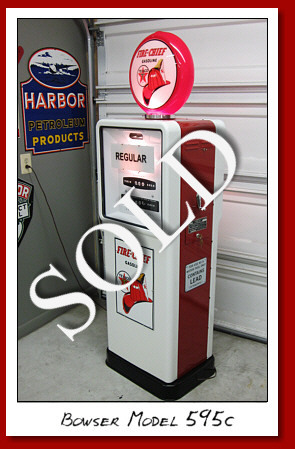 Bowser Model 241 Curbside gas pump. Circa 1910. 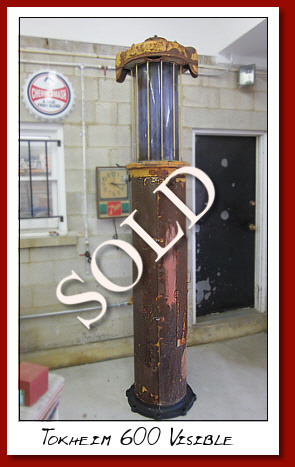 72" tall by 16" round. 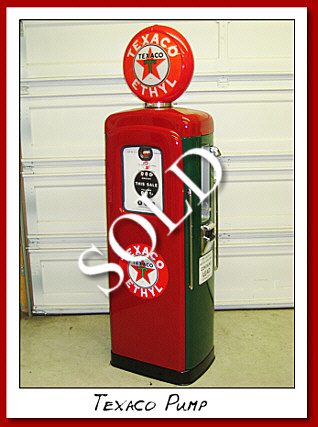 Older restoration to Texaco Star. Mechanics work. With hose and nozzle. 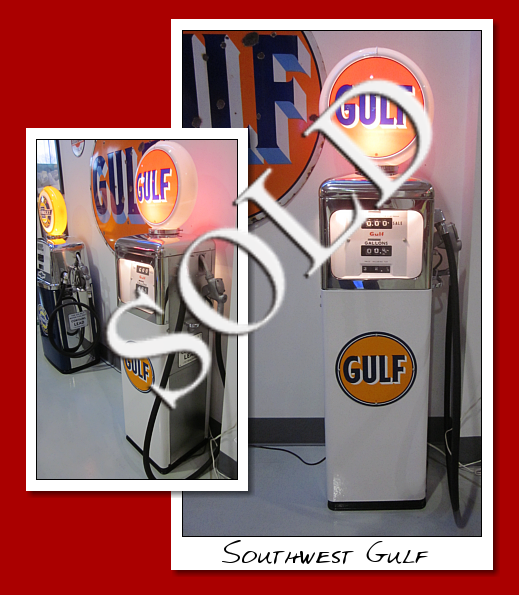 Southwest GULF gasoline pump. Circa 1948. All stainless steel has been highly polished. Correct Gulf livery. Beautiful restoration. Martin and Schwartz Model 80. Circa 1950. 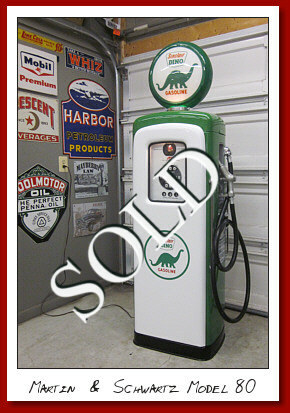 This pump was a Sunoco branded unit from day one. Note the blue/yellow spinners in the site glass. 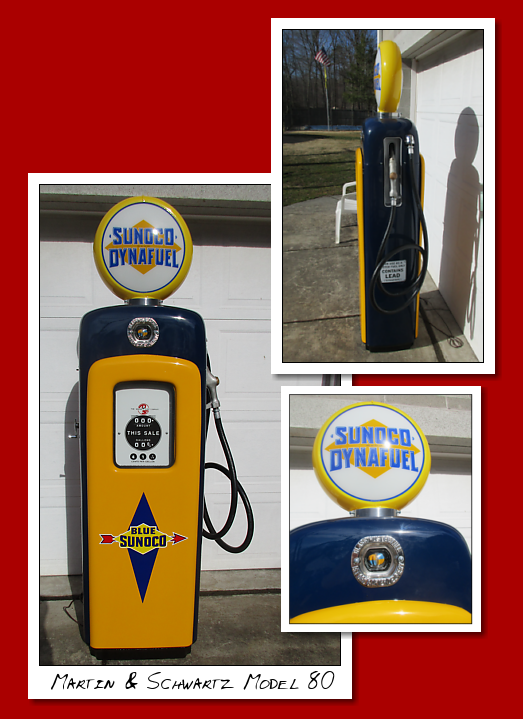 We restored it back to the Sunoco brand. 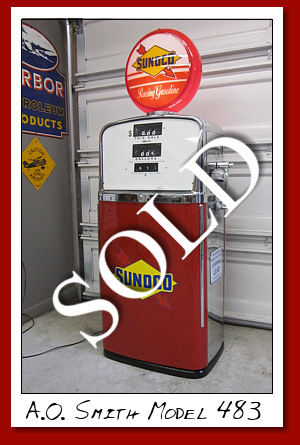 It has the very popular and sought after, Ad Glass Top with correct Sunoco 1950's period Ad Glass. 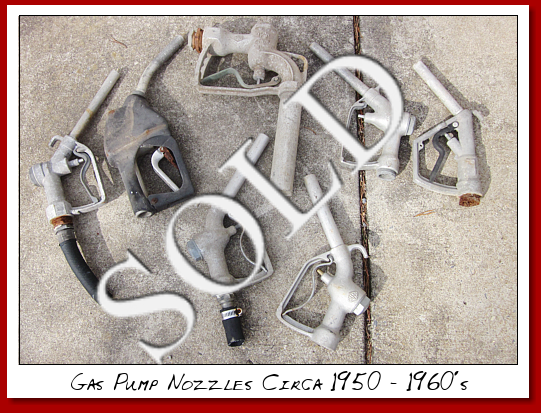 This is a lot of 7 gas pump nozzles. Circa 1950's-60's. Martin and Schwartz Mobilgas Script Top. Circa 1950. The most cherished top of this kind. It can change a simple Martin and Schwartz Model 80 into a unit worth nearly twice that of the standard value. This top is sound. Light surface rust but is easily restored. No rust through anywhere. New plastic letters are available aftermarket. Can ship via postal, at buyers expense. 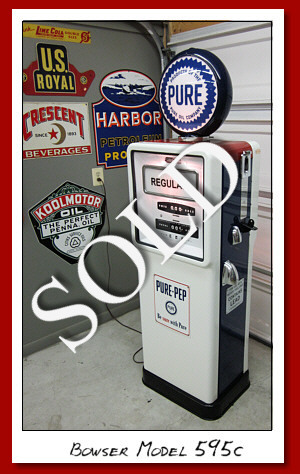 National Model A38 gas pump with an old restoration to Pure Oil Co. Circa 1938. Very Art Deco in style. Pump has one original porcelain Pure door plate dated in the 50's. All mechanics are inside as well. Comes with a black hose and nozzle. 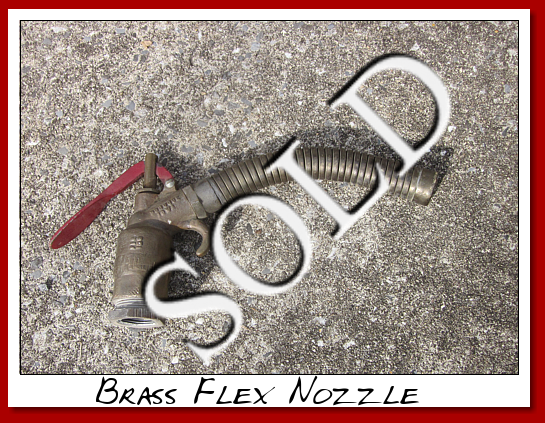 Morrison Brothers early 1 inch brass flex nozzle. Unique top handle version. Very sought after. 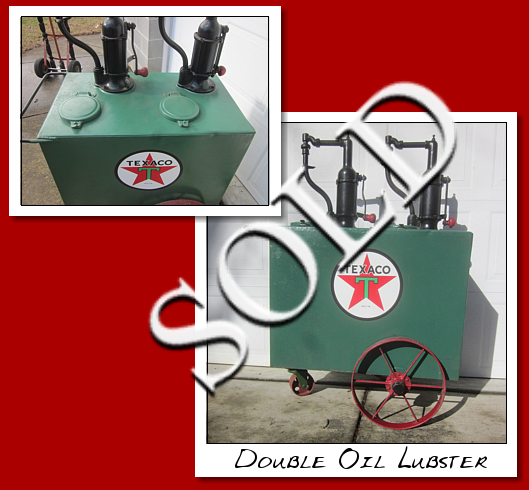 Double oil lubster on iron wheels. 53" tall by 38" long, incl. handle, by 20" wide. Has 15" main wheels and a 5" trolley wheel. This is an older restoration which still looks good. Pumps work. Rolls easily. Two individual 30 gallon tanks combined. 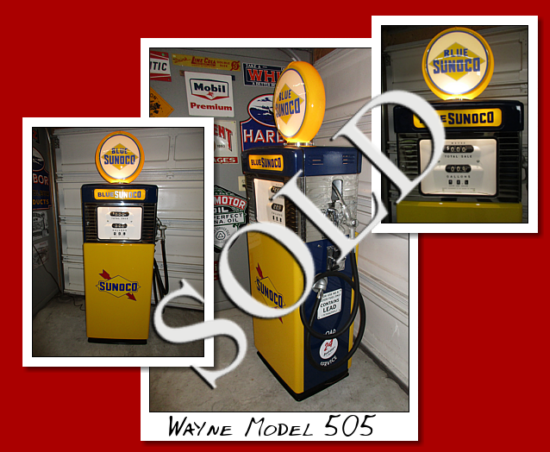 Wayne Model 505 gas pump restored to Sunoco gasoline. circa 1955. Great condition. Wayne Model 100B. Circa 1947. Watch Dog Faces..." Wayne Honest Measure". 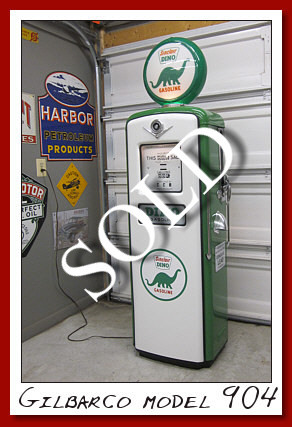 Restored to Sinclair Dino Gasoline. Gilbarco Model 443. Circa 1959. Just restored. We had all the stainless steel polished to a mirror finish. All the chrome was re-chromed to a high luster. Dark blue lower doors. We removed the florescent tube lights and replaced with new LCD lights and runner in face area. As you can see by the photos, it gives the proper look, and is efficient. Very unique pump. 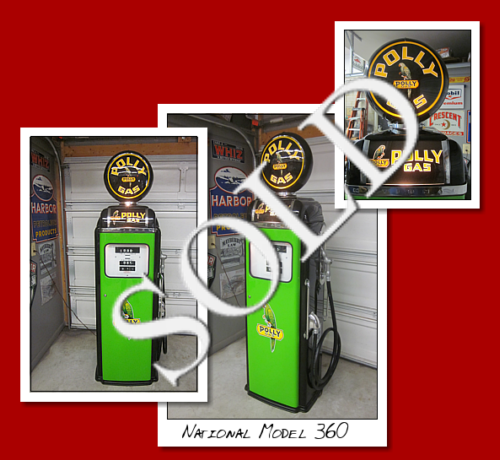 National Model 360 gas pump. 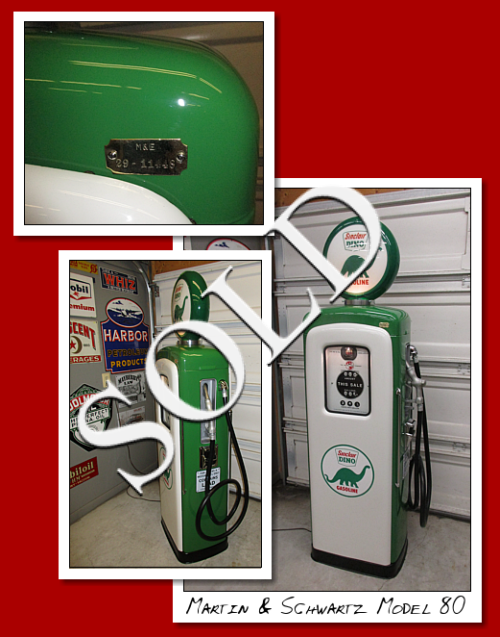 Restored to Poly Gasoline This pump is circa 1955. 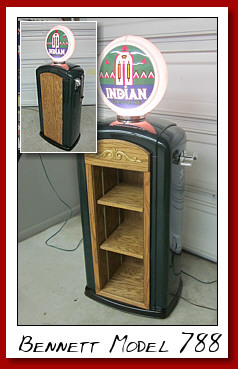 It has a lighted ad top which is not seen often and is very desirable. 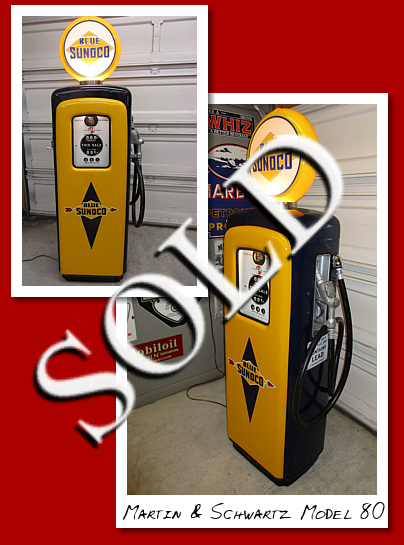 Martin and Schwartz Model 80 restored to Sunoco Gasoline. Circa 1950. 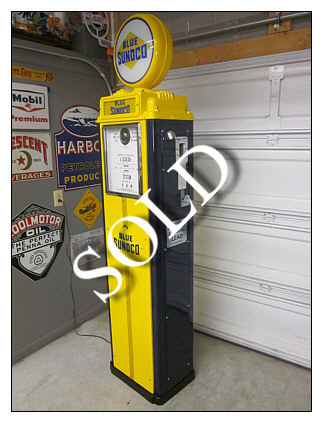 This pump has the correct and original blue/yellow site glass spinners, used exclusively by the Sun Oil Co.
Martin and Schwartz Model 80 Ad Top restored to Mobilgas Special Gasoline. 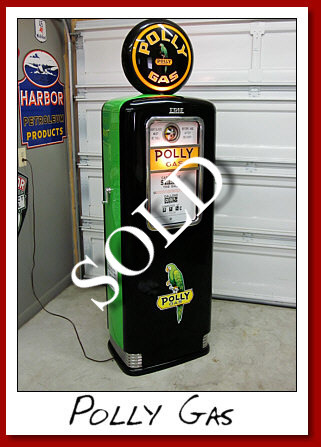 Tokheim Model 36b Circa 1936 Restored to very early Poly Gasoline colors. 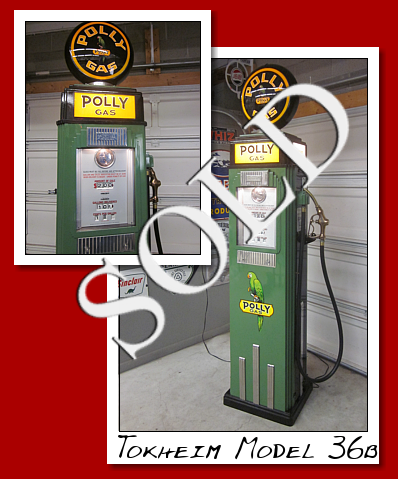 Poly Gasoline was a Southern California company. 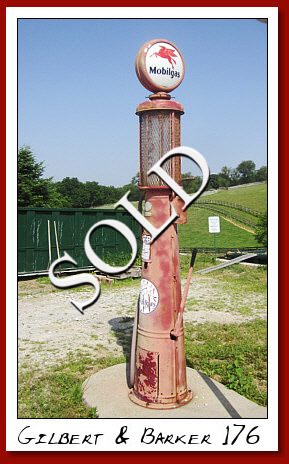 Great pump and must sought after. 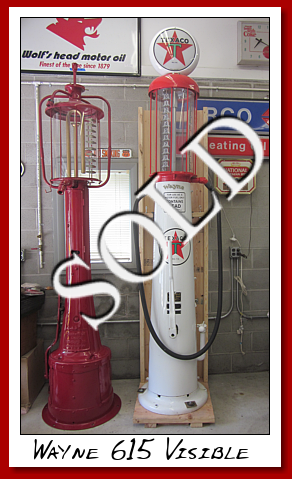 Here are a matched set of Tokheim tall electric gas pumps, circa 1940. These have the pumps, motors and all tubing inside. 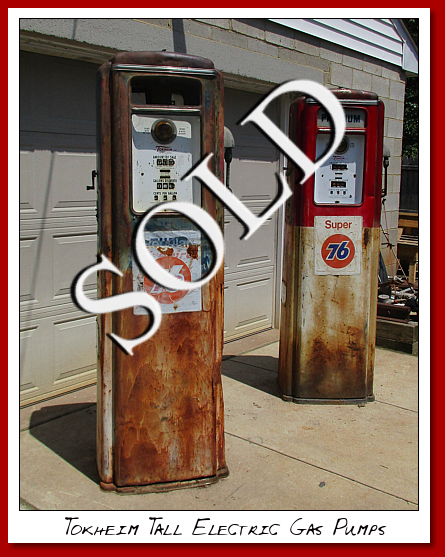 They were at an old Union 76 service station in Danville, Virginia until we picked them up last week. 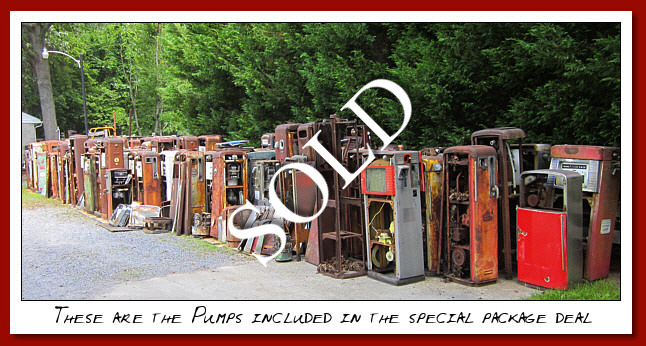 I get a lot of calls for original unrestored units. There are folks who like this rustic appearance. Here is the opportunity to own a set at a fair price. 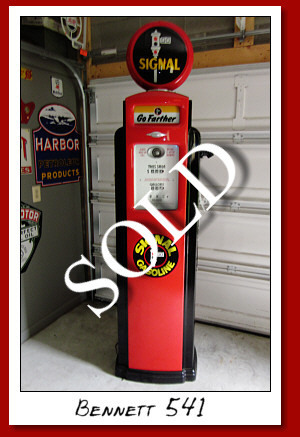 Dayton Model 1510 gas pump. Circa 1948. 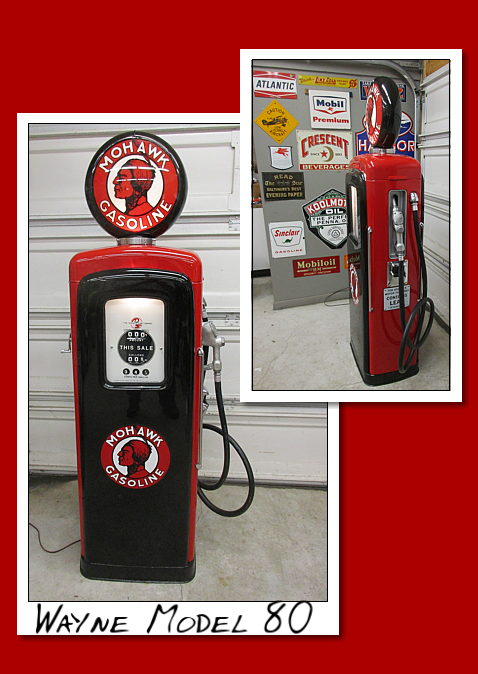 Restored to Mohawk Gasoline. 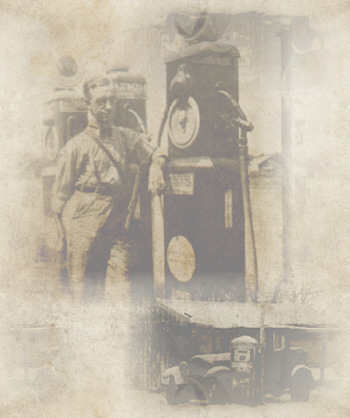 Mohawk was an upper West Coast fuel company. Great restoration with lots of chrome. Fry Model 117. Circa 1925. 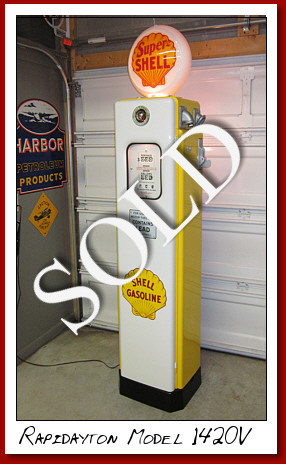 Ten Gallon Visible gas pump. 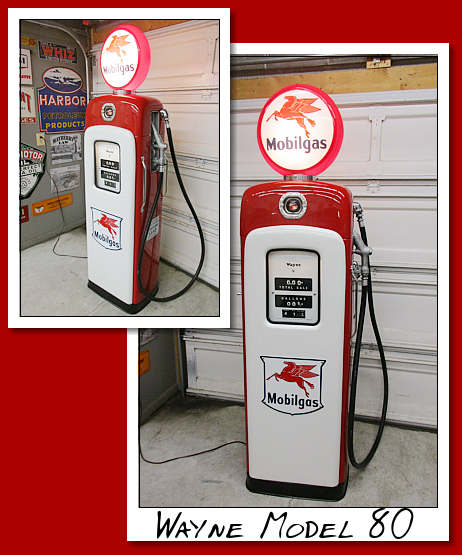 Restored to Mobilgas with milk glass globe, white cloth hose, brass nozzle, acrylic cylinder and gold pin stripping through out. Totally breathtaking unit. 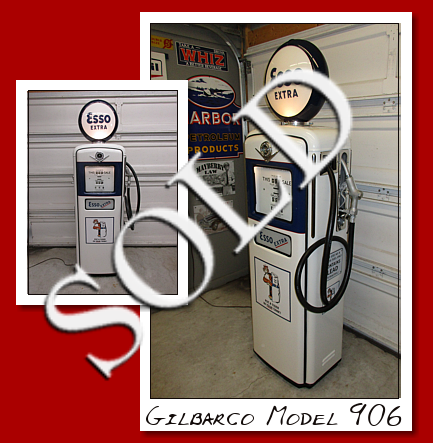 Gilbarco Model 994 gas pump. Circa 1949. 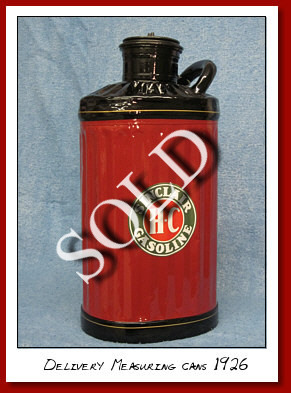 Restored beautifully to Sinclair H-C Gasoline. 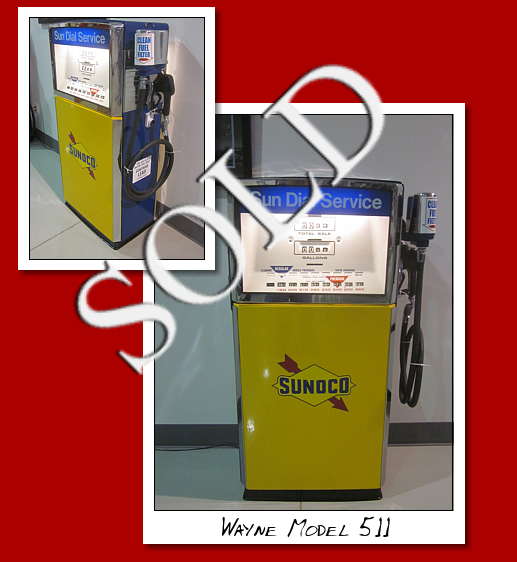 Wayne Model 511 Multi-Blend gas pump. Circa 1958. 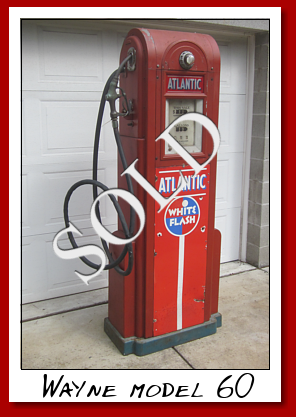 Restored correctly to Sunoco gasoline. 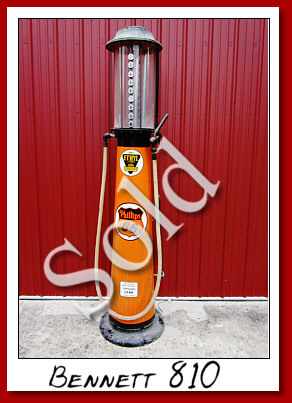 This pump was a unit that was sought out by the 1960's Muscle Car Guys since it vended 260 blended gasoline. It had the most octane available at that time. Kind of like the racing fuel used today by NASCAR. 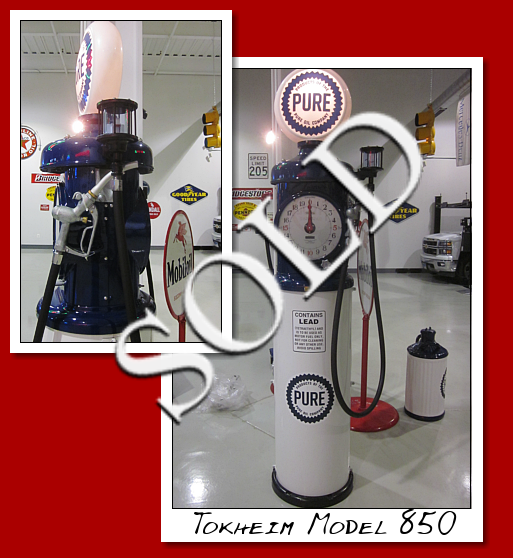 Tokheim Model 850 Clockface gas pump. Circa 1930. Perfectly restored to PURE Gasoline. 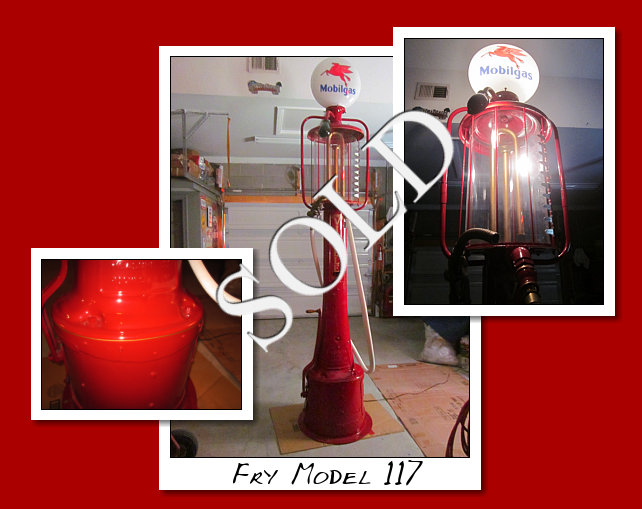 Fry Model 17 Visible Gas Pump. Circa 1925. 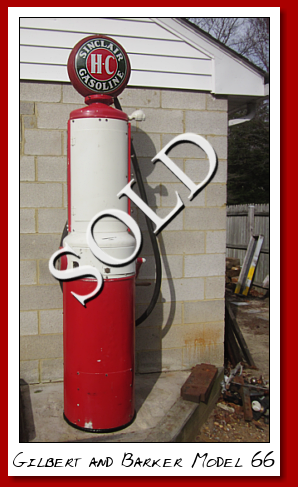 Original gas cylinder in perfect condition. 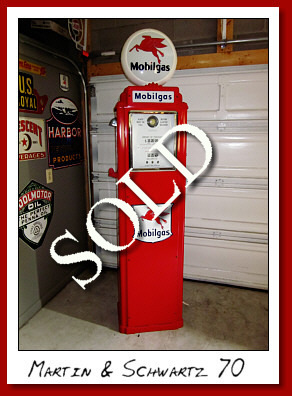 Restored to Mobilgas. 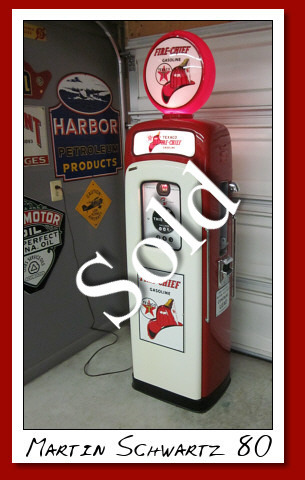 Neptune Red Seal Model 855 pump. Circa 1939. 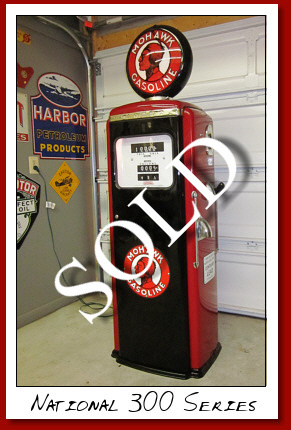 Restored to Indian Gasoline, a Northeast oil company absorbed by Texaco in order to have access to the companies Havoline Oil blend. Fry Model 117. Circa 1925. Ten Gallon Visible. 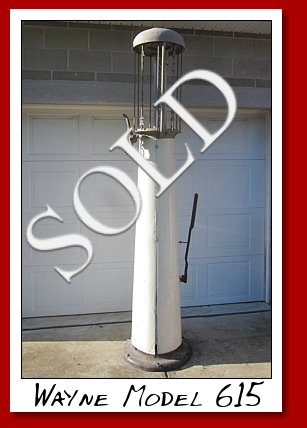 Original glass cylinder in perfect condition. 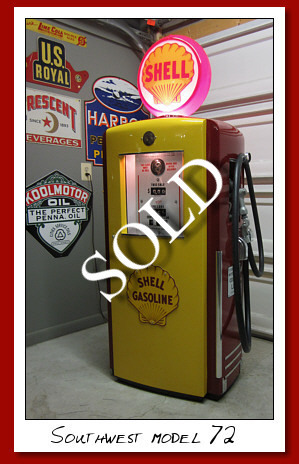 Beautiful restoration to "Gasoline" as was proper for this time period. 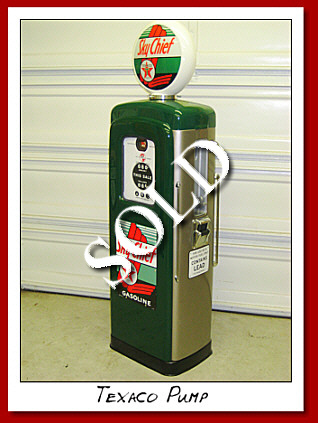 Wayne Model 615 visible, gravity feed gas pump. Circa 1928-1941. 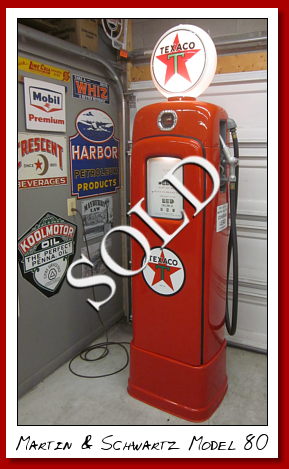 Older restoration to Texaco Ethyl. 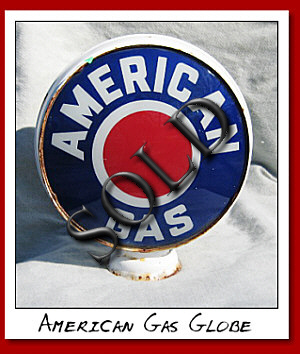 Has an acrylic cylinder. This is part of a collection which we just acquired. Only issue is that there is no light in the top. It is an easy fix. 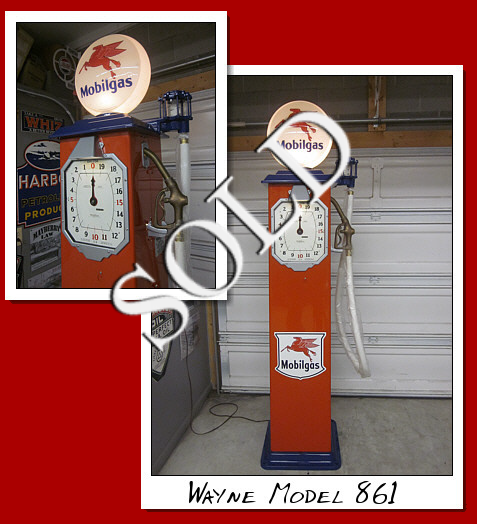 Wayne Model 861 Clockface Mobilgas pump. Circa 1932-38. Just acquired from a private collection in North Carolina. The restoration is perfect and comes with a white cloth hose, brass nozzle and a milk glass globe. 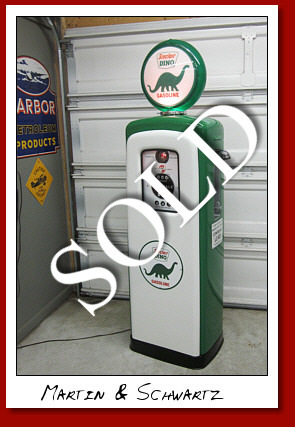 This is a very Rare version of this unit, and very collectable. Bennett Model 1066. Circa 1956-57. 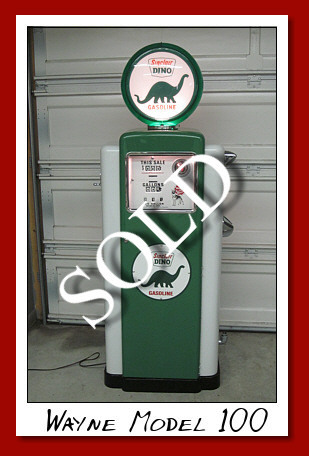 Restored to Sinclair Dino gasoline. 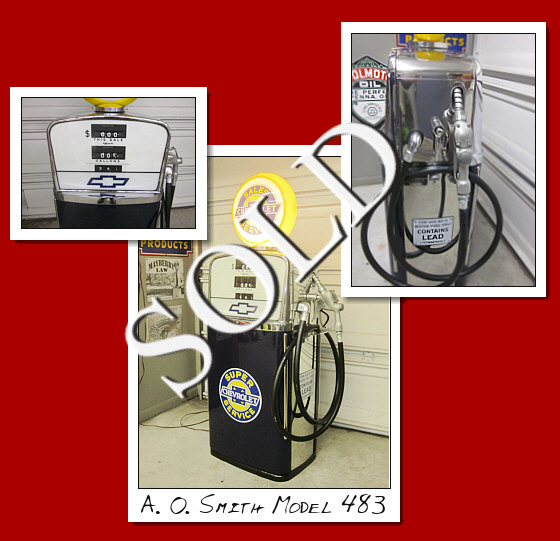 A.O.Smith Model 483. Circa 1959. 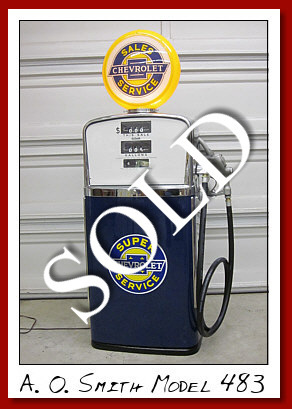 Restored to Chevrolet Super Service. Highly polished stainless steel and chrome. 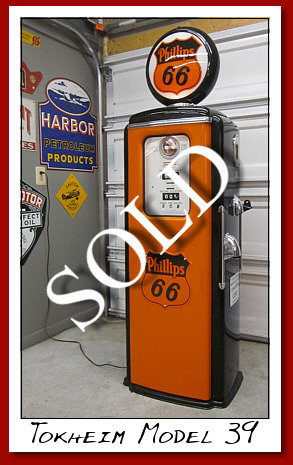 Great pump to display with muscle car era. Bowser Model 575 Circa 1941-1948. 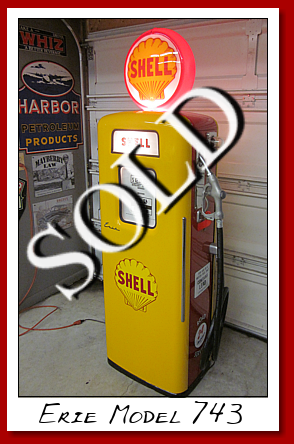 Restored to Shell gasoline. Very nice restoration. Part of the same collection recently purchased. 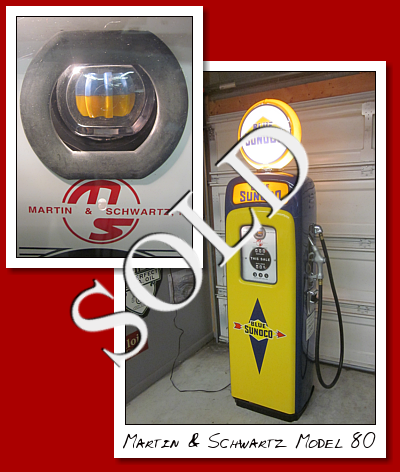 Martin and Schwartz Model 80 Ad Glass top, restored to Sunoco gasoline. 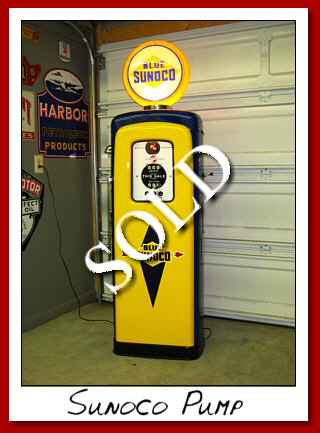 Circa is 1950 and the pump was originally built for Sunoco as the blue/yellow spinners attest. 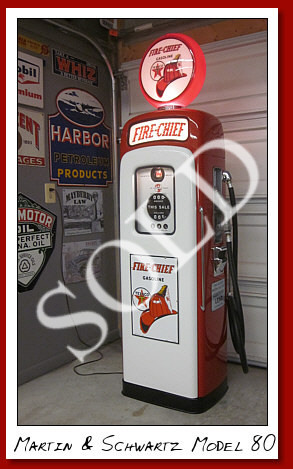 Martin and Schwartz Model 80 restored to Texaco Firechief Gasoline. Circa 1950. With original porcelain faces. 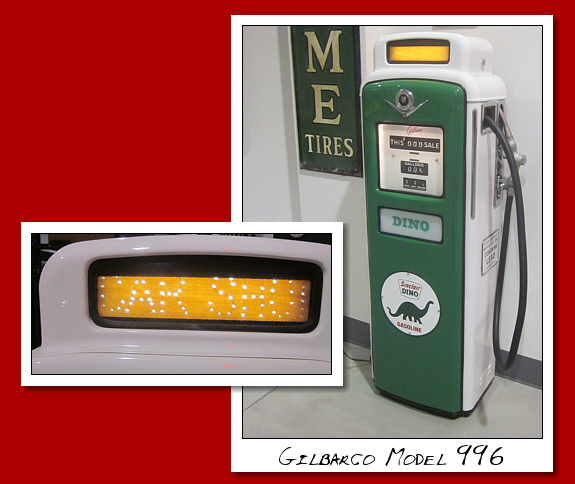 Gilbarco Model 96 restored to Sinclair Dino gasoline. Circa 1938. Remanufactured, post WW2 to a shorter version to keep pace with automotive styling during the Fifties. 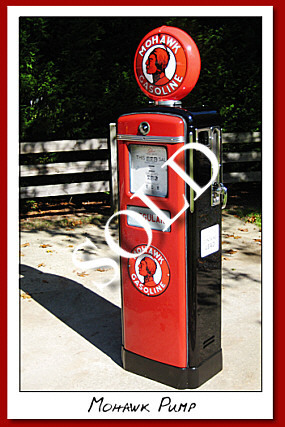 Overall height with globe is 82 inches, which makes it a bit taller than pumps built in the 1950's era. 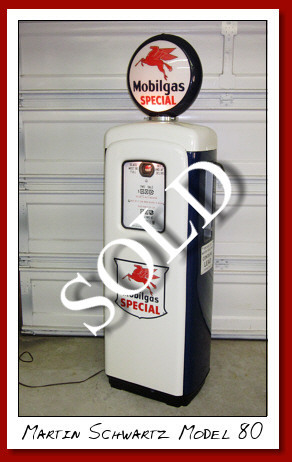 to Mobil Gas Special Gasoline. 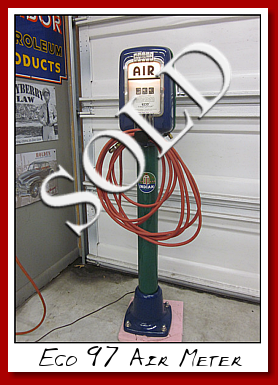 Martin and Schwartz Model 80 Ad Glass Top gaspump. 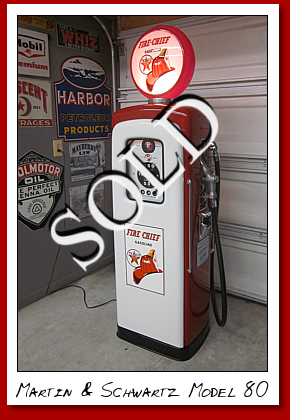 Restored to Texaco Firechief gasoline. Circa 1950. Tokheim 39 circa 1951. 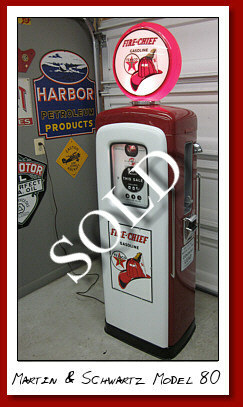 Restored to Texaco Firechief. Martin and Schwartz Model 80 tall base. 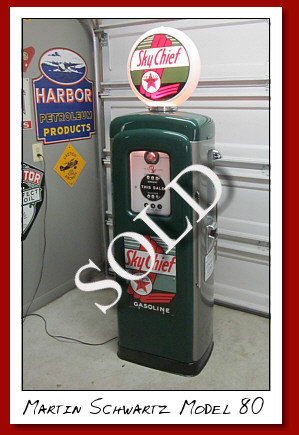 Restored to Texaco Skychief. Circa 1948-50. Pump is 90 inches tall. Martin and Schwartz Model 70. Circa 1937. 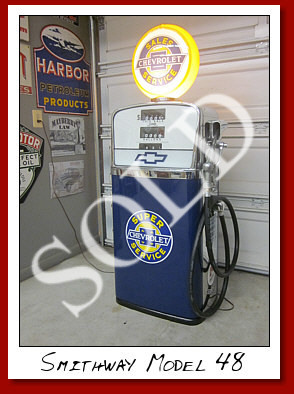 Built exclusively for Sunoco Oil Co. using the very rare, art deco cast iron ad glass top and the blue and yellow sight glass spinners. Very, very unusual to find one that is complete. The unit has all the original porcelain door trim down the center and one original door diamond. One diamond is a repro used to complete the restoration. Just finished with all stainless polished and bright metal re-chromed. 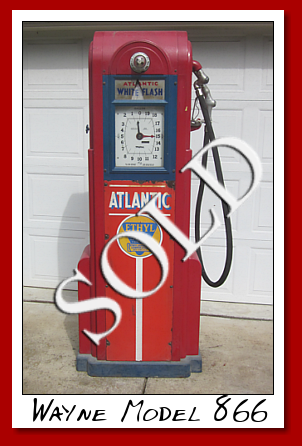 Wayne Model 866 Clock Face gas pump in as is condition. Has Atlantic Ethyl porcelain doors, on both sides, which are extremely difficult to find. 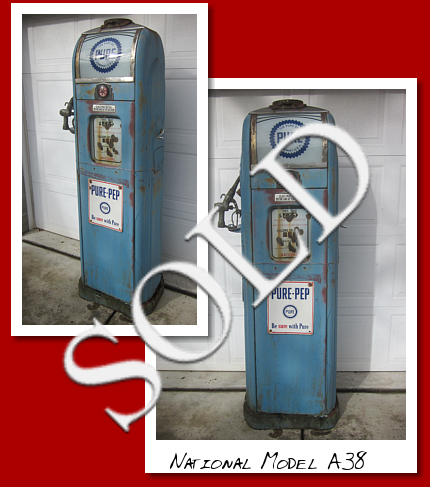 Very good original condition with pump still inside. Circa 1934-47. 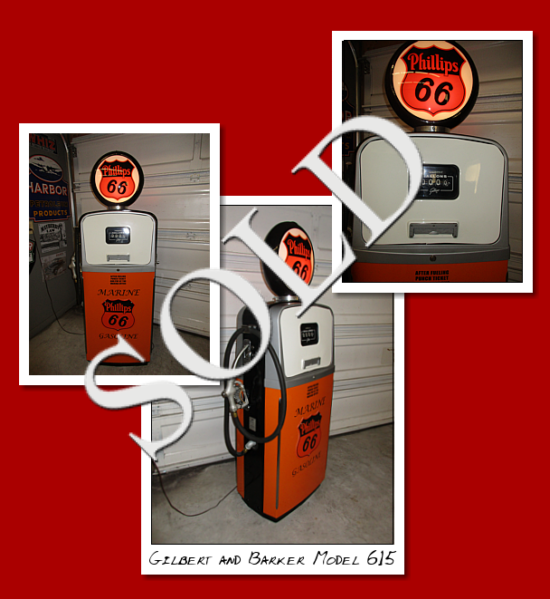 Gilbert and Barker Model 176 Visible gas pump in Mobilgas. Old restoration. Has a Lucite cylinder but I have the original glass cylinder for this unit. Circa 1926. Very good overall condition. 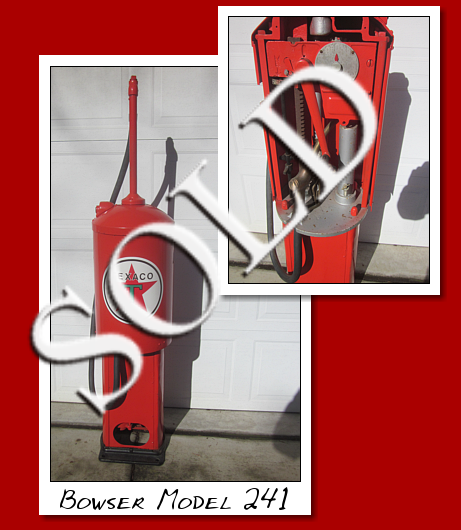 Martin and Schwartz Model 80 restored to Texaco Firechief gasoline. Gilbarco Model 134 circa1961. 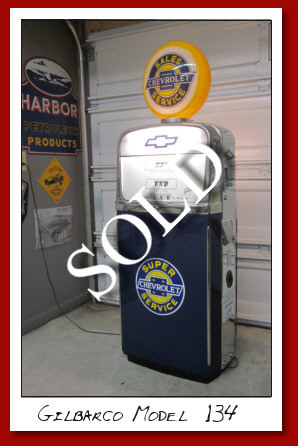 It has been fully restored to Chevrolet Super Service. Lots of chrome and polished stainless steel. Tokheim 600 Visible. PURPLE cylinder. Gilbarco Model 1100 series. Circa 1956. 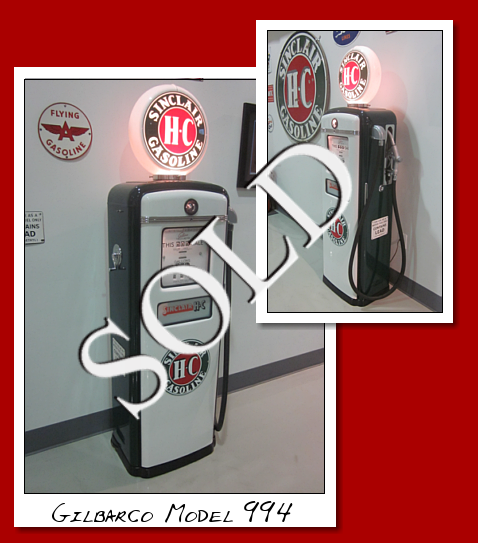 Restored to Texaco gasoline. Martin and Schwartz Model 80 circa 1950. 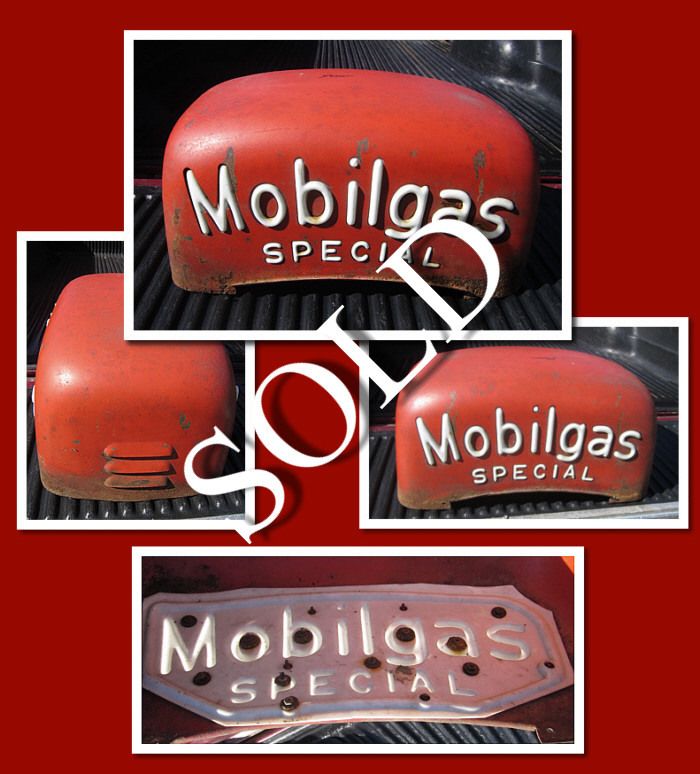 Restored to "Mobilgas Special". Wayne 80, circa 1950. 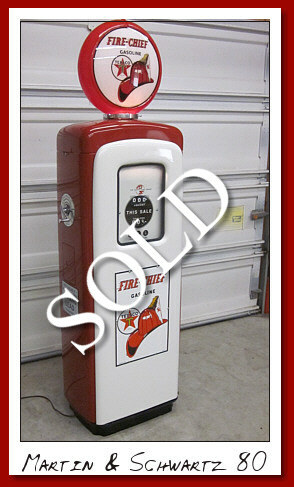 Restored to Texaco Firechief. Rapidayton Model 1420V Circa 1940. 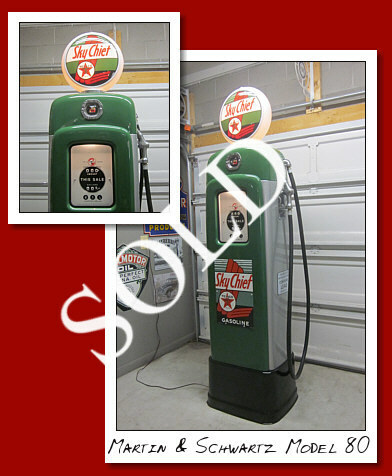 Martin and Schwartz Model 80 Circa 1950 restored to Sinclair Dino gasoline. 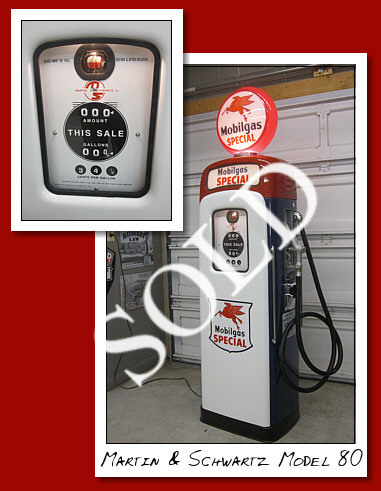 National 300 series restored to Mohawk gasoline with the racing motif. Complete with a new hose and original nozzle. 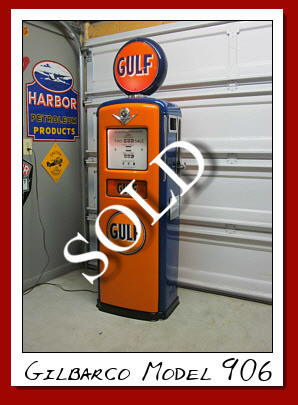 Martin and Schwartz Model 80 restored to Gulf gasoline. 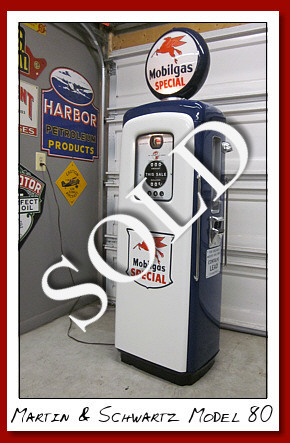 Martin and Schwartz Model 80 Mobil Gas Special Script Top. All original in very good condition. Has good plastics. This is just in from Oklahoma. It is a 1919 Boyle Dayton Gasoline Cart. Completely unrestored....in original paint. 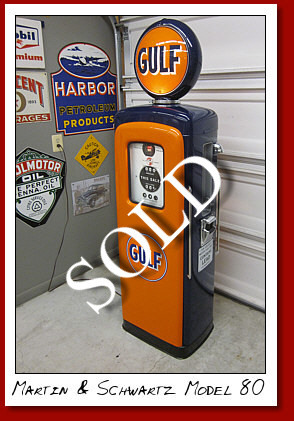 Very sought after as an extremely early piece of automotive history. 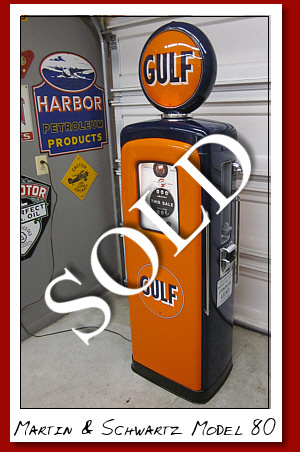 Most collectors look for the distinctive heart cut outs in the wheels. We have a new set of these solid rubber tires with it. 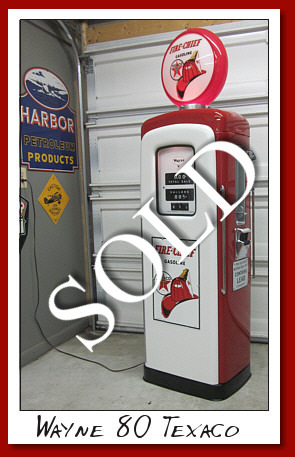 Martin Schwartz Model 80 restored in Texaco Skychief. ECO Model 98 Airmeter. 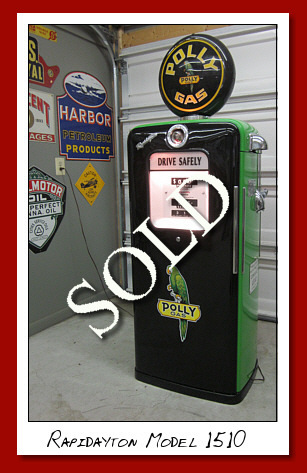 This unit has been restored inside and out. Fully functional for air delivery. With the light tower. 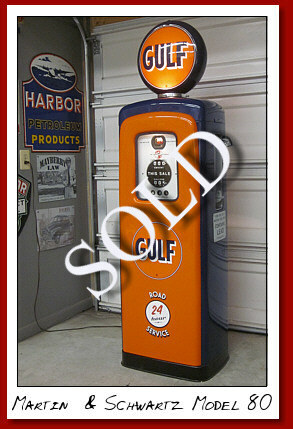 Martin and Schwartz Model 80 gas pump, restored to GULF Gasoline. Circa 1950. Martin and Schwartz Model 80 tall " Cyclops" version. Circa 1950. 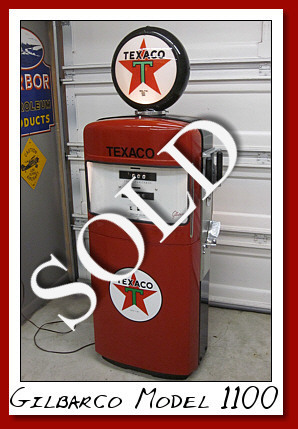 Restored to Texaco. Nicely restored. Part of a recent acquisition. 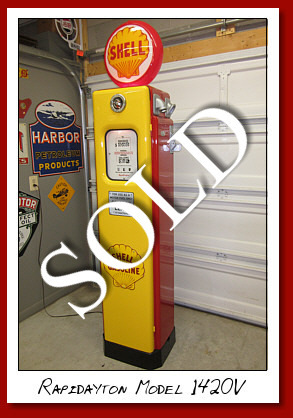 Wayne Model 60 vintage gas pump in as is condition. Has Atlantic White Flash porcelain doors on each side. 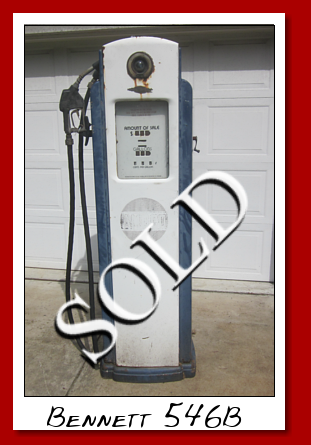 Very good original condition with pump still inside. 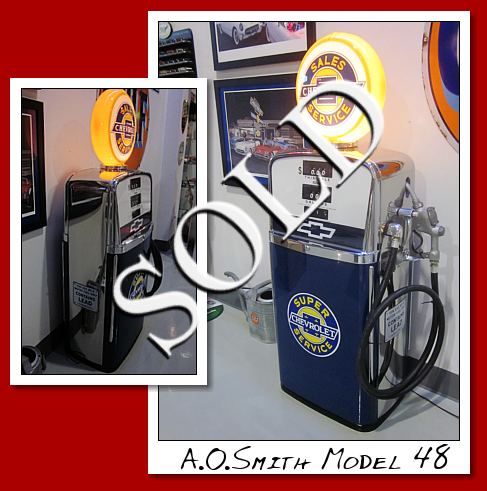 1950 Smithway Model L1 pump restored in Texaco Skychief. Martin & Schwartz Model 80 Ad Glass Top. 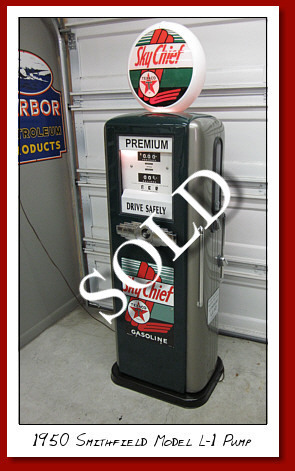 Restored in Texaco Firechief gasoline. 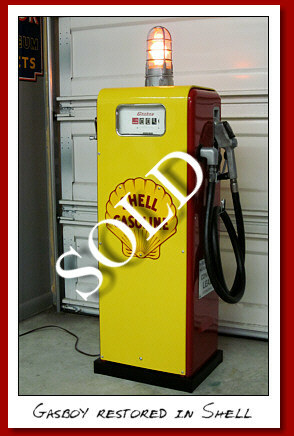 Gasboy gas pump fully restored in Shell Gasoline with original porcelain. 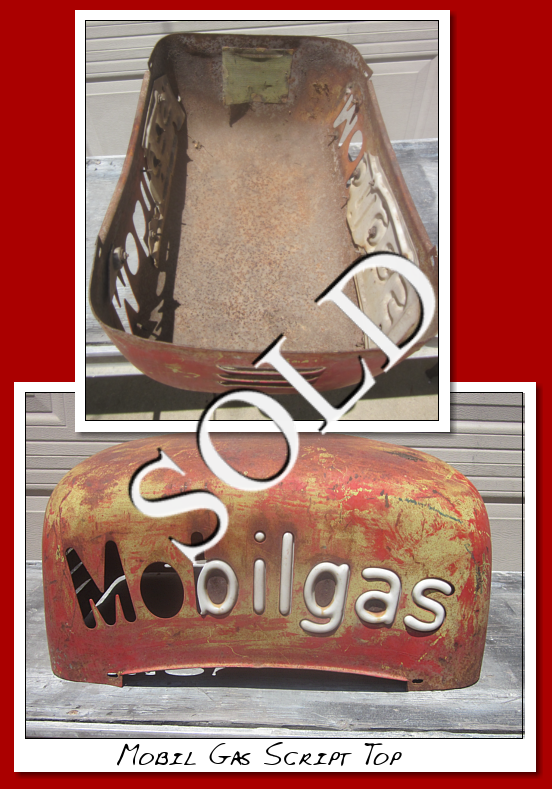 Contains lead signs and a new Shell porcelain front sign.With hose and proper nozzle. 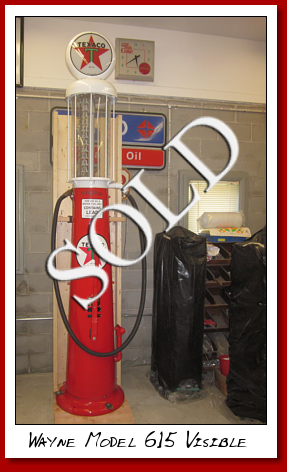 Bennett 810 visible gas pump with an old restoration in Phillips 66 Ethyl. The circa on this unit is 1930. This pump has an acrylic cylinder that lights up when plugged in. It has the pump removed to save on weight. Would be great to display in a restaurant, club room, garage door, etc. 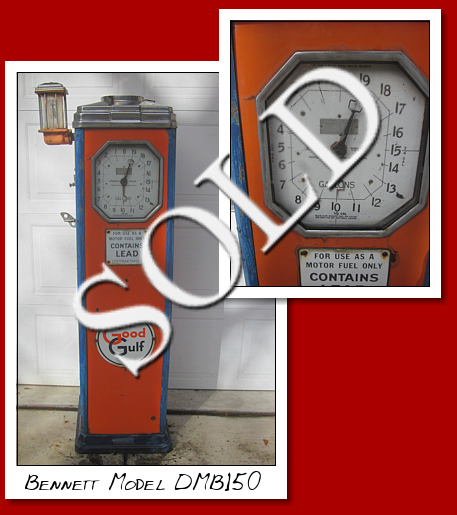 Bennett Model 1000 Kerosene gasoline pump. The circa on this item is 1927. 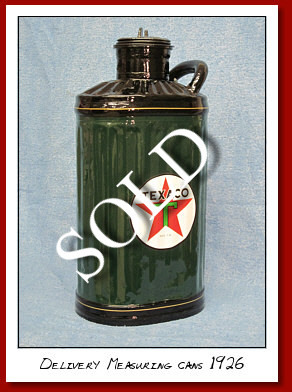 It would have been used in country stores and service stationis to supply kerosene for lights, cooking, and heating. Totally as found in a barn in Western Maryland. 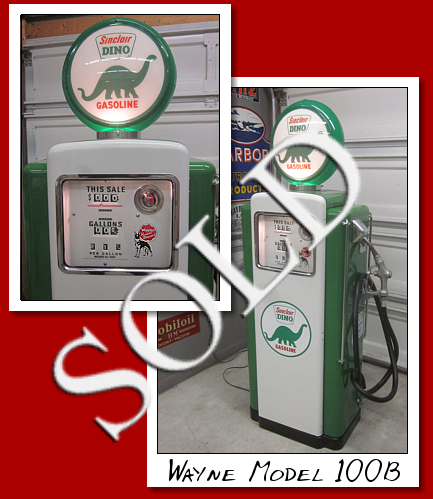 Wayne Model 100, restored to Sinclair Dino gasoline. 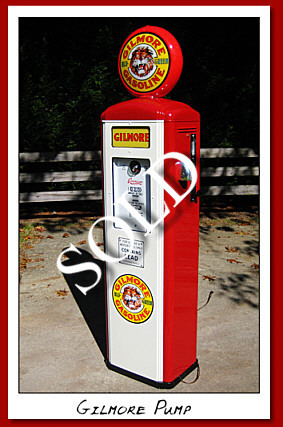 A rare American , restored in Gilmore gas....with white porcelain faces from 1939. 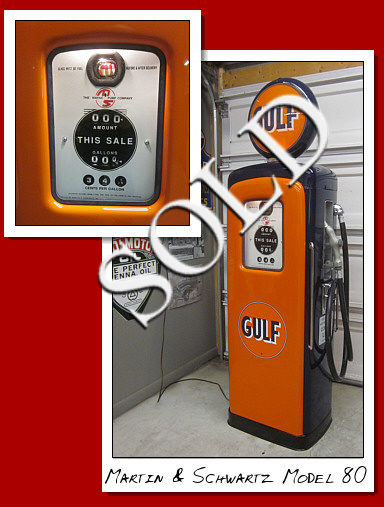 Martin and Schwartz Model 80 gas pump restored to GULF gasoline. Circa 1950. A.O.Smith Model L-3. Circa 1955. 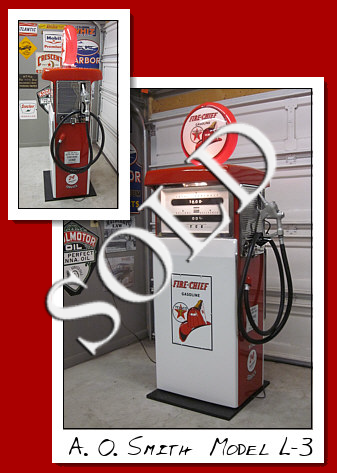 Used by all the Major gasoline companies. 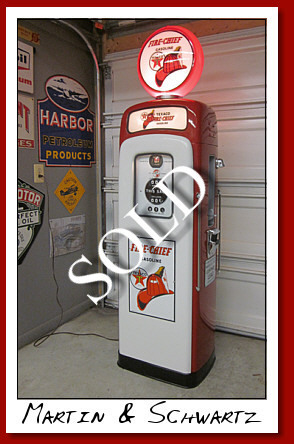 Restored in Texaco Fiechief Brand. Bennett 546B Circa 1941. Very desirable and in good original condition. Has had the pump removed. Martin and Schwartz Model 80 ad glass top restored in correct Sunoco Colors and style. 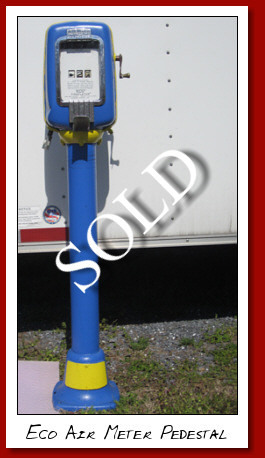 It has the blue and yellow site glass spinners which were only used by Sunoco. 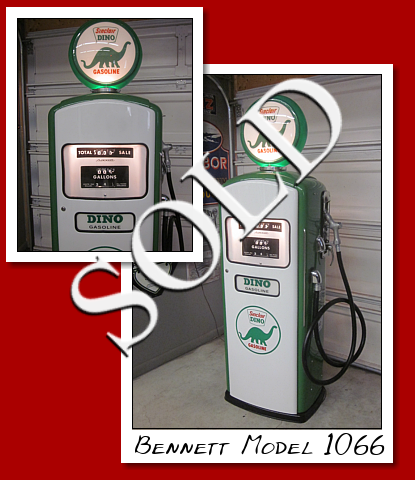 "Just taken in on trade" Bennett Model 766 gas pump with an older restoration, not done by Severn Gas Pumps. 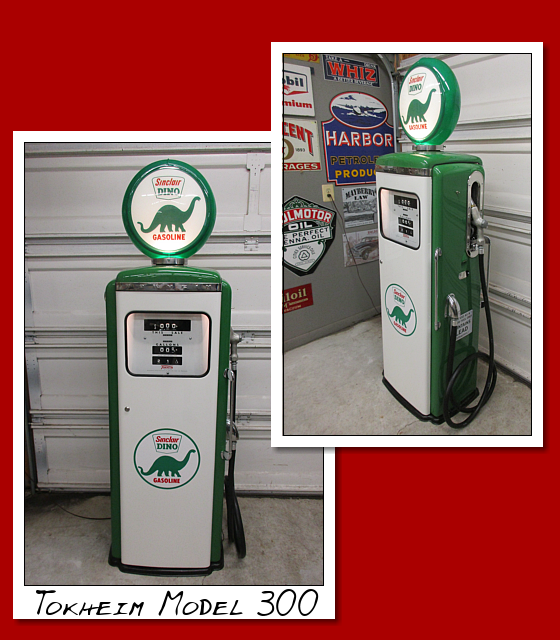 Sinclair Dino Gasoline. Circa 1948-1954. The unit has a few minor issues but displays quite well. We are offering it at a reduced price for a limited time. 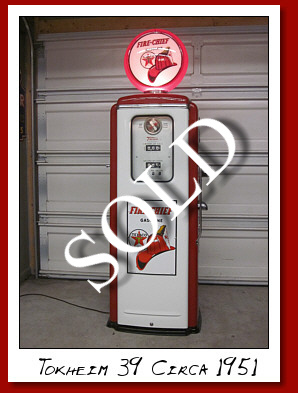 If we don't part with it, we will do a full restoration and sell it for our normal fee. Wayne Model 80. Circa 1950. 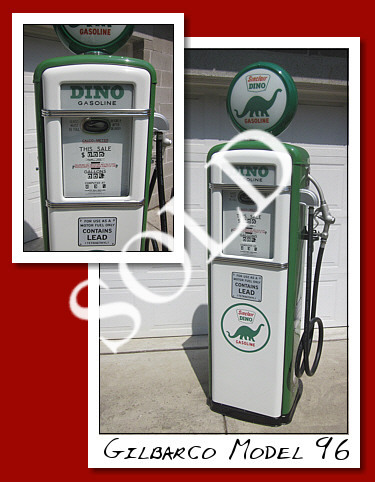 Restored to Sinclair Dino Gasoline. 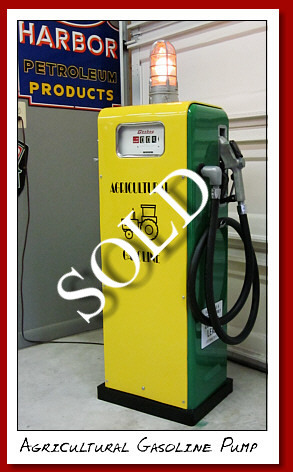 Dayton Model 300 Visible gas pump in Mobilgas. Very rare pump. Old restoration but in very good condition. Pump is complete with the wide top bonnet. Small crank version. Circa 1925. Has a Lucite cylinder but I have the correct glass cylinder for this pump. 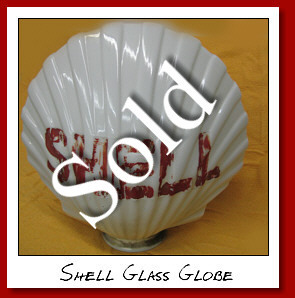 Original Shell Clam milk glass globe. Very good condition. Letters need repaint. 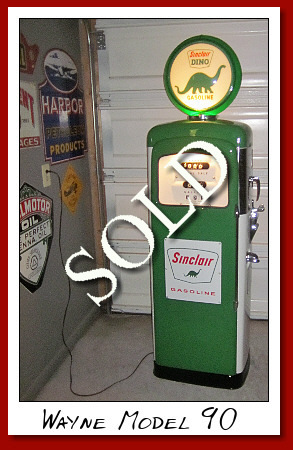 Martin and Schwartz Model 80 restored to Sinclair Dino Gasoline Circa 1950. 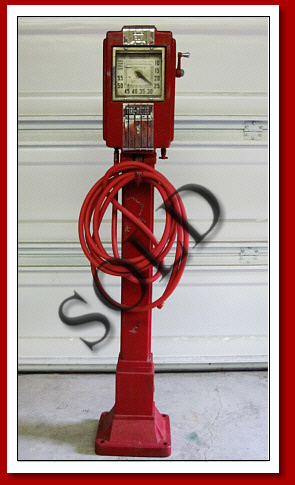 Wayne 615 visible, gravity feed gas pump. Circa 1928-1941. 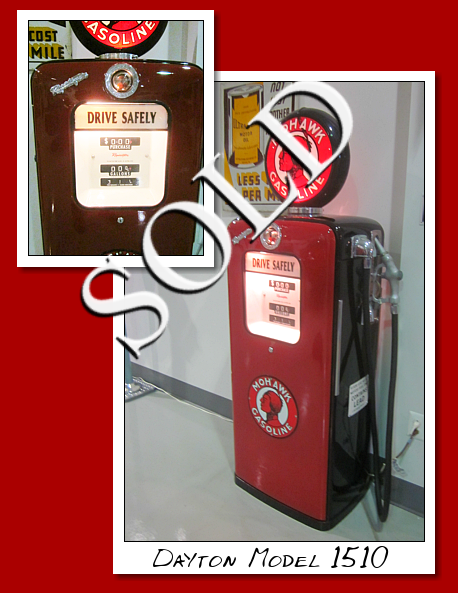 Restored six years ago to Texaco and displayed outside. In very good condition. It does have an acrylic cylinder. It has no light in the top, which can easily be fixed. This is part of a collection recently purchased. Martin and Schwartz Model 80. Circa 1950. 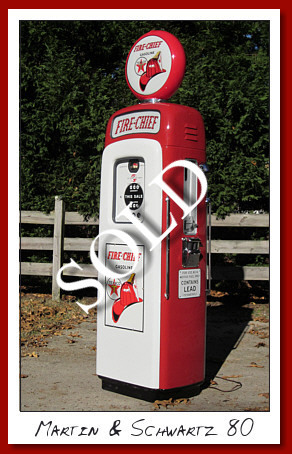 Restored to period correct Texaco Fire Chief Gasoline. 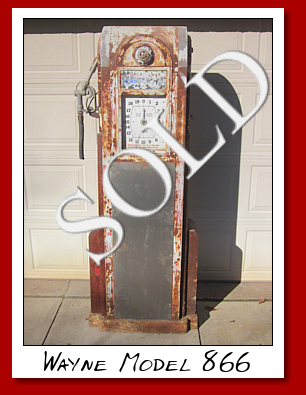 Original Wayne Model 866 Clock Face gas pump. Circa 1937. 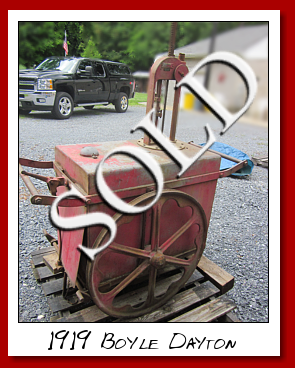 Just in from Pennsylvania farm country. 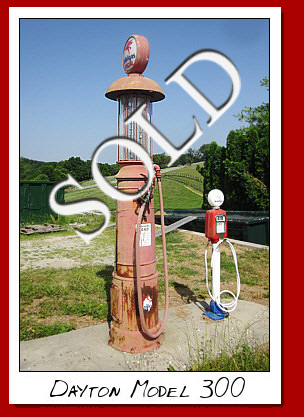 This pump is in very nice condition. We installed new metal doors. The complete pump works are inside and the clock mech. resets correctly. Comes with a hose and correct nozzle. 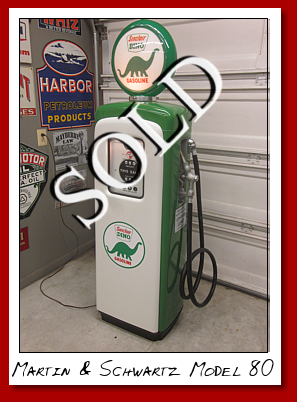 Martin and Schwartz Model 80 circa 1950 Restored in Sinclair Dino gasoline. Erie Model 743. Circa 1954. 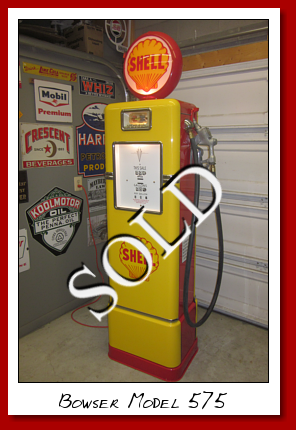 Restored to Shell Regular Gasoline. Wayne Model 615 Circa 1928. Visible/Gravity Feed gas pump. In very good condition. Straight sheet metal. Needs to be restored. Comes with as hose,nozzle and acrylic cylinder. Martin and Schwartz Model 80. Circa 1950. 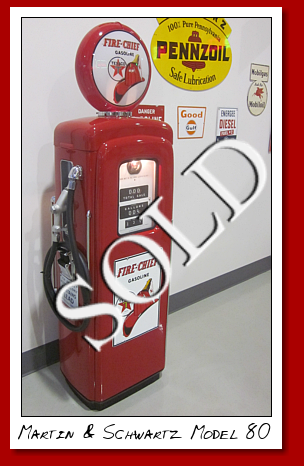 Restored to Texaco Firechief Gasoline. With the much sought after Ad Glass top. Eco 97 air meter. 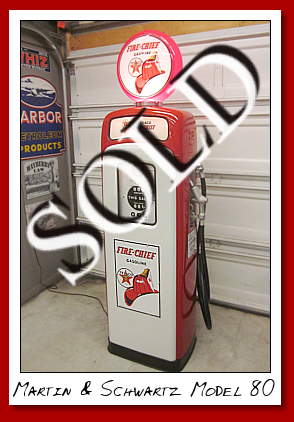 Restored to Indian Gasoline. Lighted. Plumbed to function. Older restoration, not by us. 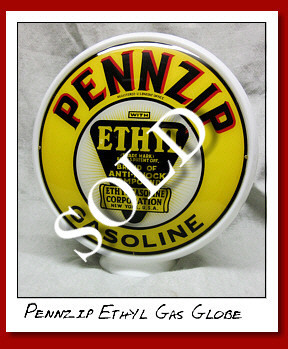 Pennzip Ethyl Gasoline Globe on a wide milkglass body. It was manufactured from 1936 - 1941. 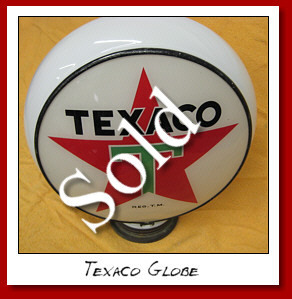 Texaco White outlined "T" on glass body. Screw base design with the metal adapter. This globe is nearly mint in all aspects. 15 inch on a low profile metal body. 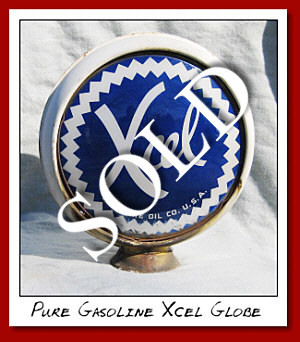 Pure Gasoline XCEL globe . Somewhat rare....15 inch high profile porcelain body. 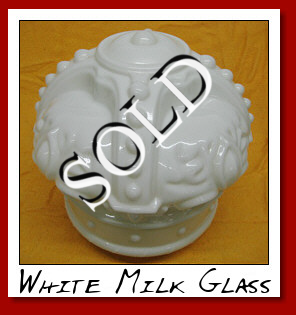 Standard Oil Crown white milk glass. Screw base design. Perfect condition. 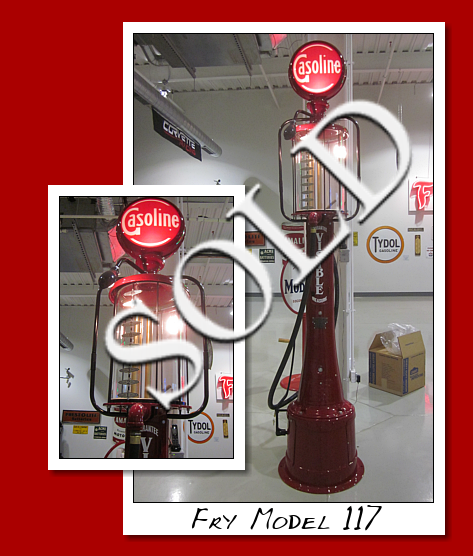 Standard Oil Red Crown gas pump globe. 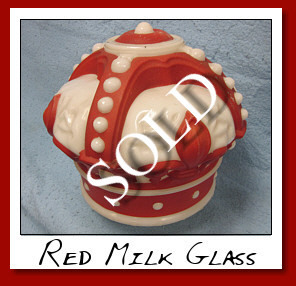 Milk glass, 7 inch, screw base design. Great condition.